Lyle: After you have learned all of these rhythm riffs, compare them to each other. Try to memorize all of these riffs or just the ones you like the best, then play them along to the jam track. They all have that classic AC/DC sound. It's the way Angus plays them. Not too much distortion either. Lyle: Let's look at a few classic Angus lead riffs. 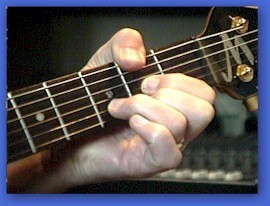 You'll be working in the key of A minor, so the A minor pentatonic scale is the one to use, just like Angus would. 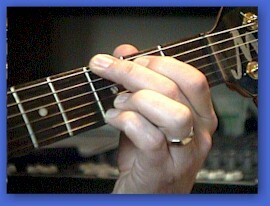 Lyle: Also, another jam track like the one you were using, but this one with a guitar in it. Lyle: And there you have it, many simple variations of rhythm riffs in the Angus style and a simple solo that you put together with typical riffs he would use like the fast vibratos on the bending riffs, and the descending pentatonic riff at the end of the little solo. These are all fairly simple riffs. Try to copy the sound of them just like how I played them and you too will get that Angus sound. Rich: How long did it take you to develop a decent vibrato? I've been working on it for 4 months with little results. Lyle: Rich, it can take time. All my favorite guitar players have good vibrato. 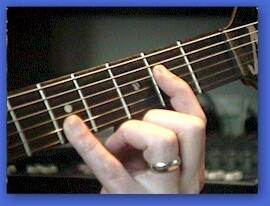 Listen to your favorite guitar players and try to hear their vibrato, then try to copy a few of their riffs. Tonehound: Is the distortion from an effects box or from tube distortion? Lyle: Tone, I use a Rocktron Voodu Valve pre-amp for all my tone and fx for these recordings. Angus just uses the amp, no pedals. Larry: Angus doesn't use any pedal effects? Lyle: Larry, nope, just guitar straight into a Marshall. 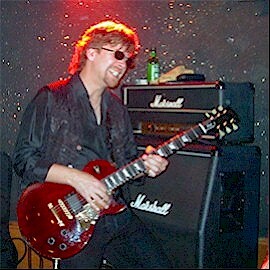 That's what I do when I play live with my band, a Les Paul straight into a Marshall. Lyle: Here's me with my LP and Marshall at a small club gig. speezer: Angus likes an SG, right teach? Lyle: Yes, Angus always plays an SG guitar by Gibson. Lyle: Well I better go, hope you found a few new riffs to work on this lesson!